Plenty of animals build their homes in oak trees. But some very teeny, tricky wasps make the tree do all the work. “What nerve!” you might say. What… gall! And you’d be right. The wasps are called gall-inducers. And each miniature mansion that the trees build for the wasps' larvae is weirder and more flamboyant than the next. If you’ve ever spent a Summer or Fall around oak trees - such as the stalwart Valley Oak - Quercus lobata, or the stately Blue Oak, Quercus douglasii - you may be familiar with the large, vaguely fruity-looking objects clinging to the branches and leaves. 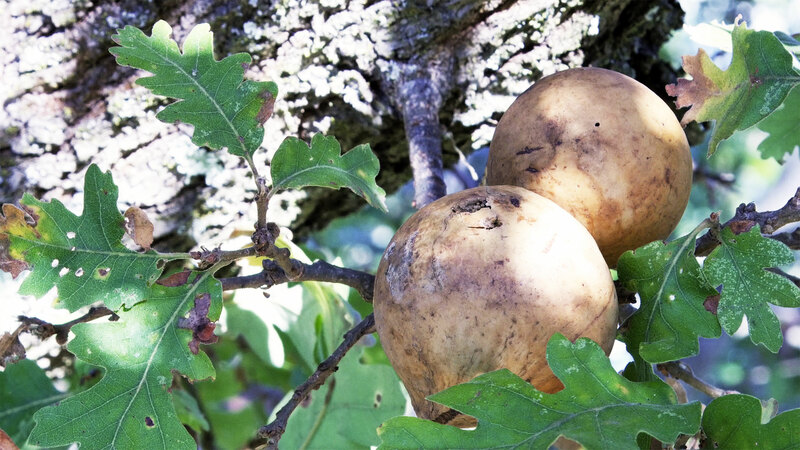 Commonly called oak apples, these growths are the last thing you’d want to put in your mouth. They are intensely bitter, loaded with tannin compounds - the same compounds that in modest amounts give red wine its pleasant dryness, and tea its refreshing earthy tang. Oak apple gall from the California Oak Gall Wasp (Andricus quercuscalifornicus). That said, the oak apple’s powerful astringency has been prized for millennia. Tanning leather, making ink or dye, and cleaning wounds have been but a few of the gall’s historical uses. But on closer inspection of these oaks - and many other plants and trees such as willows, alders, manzanitas, or pines - you can find a rogue’s gallery of smaller galls. Carefully peeking under leaves, along the stems and branches, or around the flower buds and acorns will likely lead you to unexpected finds. Smooth ones. Spiky ones. Long skinny ones, flat ones, lumpy, boxy ones. From the size of a golf ball down to that of a poppy seed. These structures wear shades of yellow, green, brown, purple, pink and red - and sometimes all of the above. A single tree may be host to dozens of types of gall, each one caused by a specific organism. And their shapes range from the sublime to the downright creepy. One tree may be encrusted with them, like a Christmas tree laden with ornaments and tinsel; and the next tree over may be almost completely free of galls. Why? It’s a mystery, like many other aspects of Cecidology, the study of plant galls and their inducers. A cluster of galls by the Crystalline Gall Wasp (Andricus crystallinus) under the leaf of a Blue Oak (Quercus douglasii). Who causes galls? Lots of creatures; midges, mites, aphids, flies, even bacteria and viruses. But the undisputed champs are a big family of little wasps called Cynipids- rarely exceeding the size of a mosquito, a quarter of an inch in length. “These tiny wasps cannot sting,” says Dr. Kathy Schick, Assistant Specialist/Curatorial Assistant at the Essig Museum of Entomology at UC Berkeley. 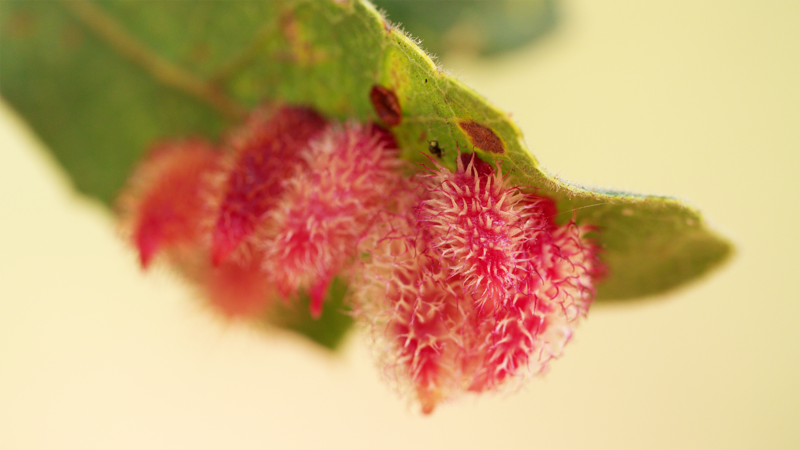 “Gall-inducers are fascinating in that they are very specialized to their organ of the host plant.” Galls are generally formed when an insect, or its larvae, introduce chemicals into a specific location, to push the plant’s growth hormones into overdrive. This can result in a great profusion of normal cells, increased size of existing cells, or the alteration of entire plant structures into new, alien forms. The California Gall Wasp (Andricus quercuscalifornicus). This member of the Cynipid family is on the larger side - about 1/4" long. These wasp houses are not homes exactly, but more akin to nurseries. The galls serve as an ideal environment for wasp larvae, whether it is a single offspring, or dozens. The tree is tricked into generating outsize amounts of soft, pillowy tissue inside each gall, on which the larvae gladly gorge themselves as they grow. But gall-inducers are not the only wasps who come to the party. All the free eats and nice digs attract uninvited guests. These other wasps - called inquilines - invade other galls to steal the food from the larvae. Yet another kind of wasp -- a parasitoid -- injects its eggs into the first wasp’s gall, so its offspring can eat the plant tissue eating the food and even the residents. 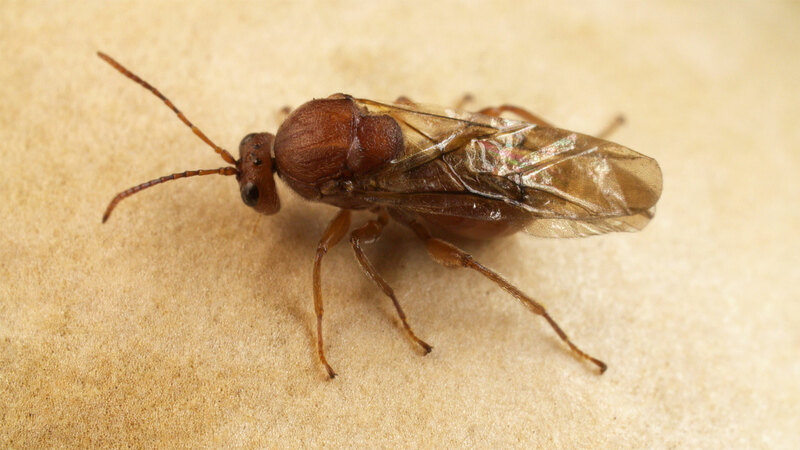 And the parasitoids, they have to watch out for other Johnny-come-lately wasps called hyper-parasitoids, which go after their larvae or even the parasitoids themselves. And on and on. 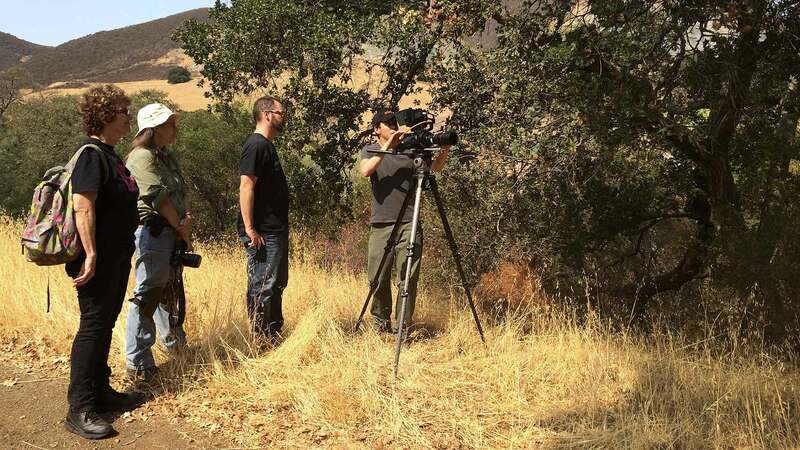 Left to Right: Dr. Kathy Schick of UC Berkeley's Essig Museum of Entomology; Joyce Gross, Berkeley Natural History Museums; the author; and Joshua Cassidy, Lead Producer / Photographer for KQED's Deep Look series. But assuming the original offspring survive, the larvae pupate and as new adult wasps chew their way out - weeks, months, or even years later depending on the species and environmental conditions. Then off to find a mate. Or not? The life cycle of gall-inducers can be exceedingly complex, especially among Cynipids.There can be both sexual (male and female get together, eggs are fertilized) and asexual (no males = parthenogenic) phases at different times of year, which result in different types of galls, even on different parts of the plant. And the California Gall Wasp in our video, Andricus quercuscalifornicus? Researchers are still searching for a male specimen. To date, not a single one has been found. It is debated whether they even exist at all. Yet another unsolved mystery, in the under appreciated realm of plant galls and their iinhabitants.